Chemistry 3B: Chemical Structure and Reactivity. Spring 2006. Professor Peter Vollhardt. Chemistry 3B represents the second semester of the standard organic chemistry series at UC Berkeley. It covers conjugation, aromatic chemistry, carbonyl compounds, carbohydrates, amines, carboxylic acids, amino acids, peptides, proteins, and nucleic acid chemistry. Ultraviolet spectroscopy and mass spectrometry will be introduced. 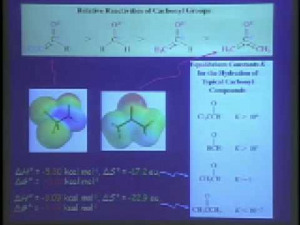 Organic chemistry is a specific discipline within the subject of chemistry. It is the scientific study of the structure, properties, composition, reactions, and preparation of chemical compounds of carbon and hydrogen, which may contain any number of other elements, such as nitrogen. Snapshot from Lecture 9: Aldehydes.